Early on this year, it became evident that I would need to purchase a new car soon. Up until last week, I drove a 2002 Mazda Protege5 I had purchased two years ago. It was the first car I owned. When I bought it, it had it's defects. It had very high mileage, it was starting to rust, had some dents, and so forth. But the interior was mostly in excellent condition and clean, which was very important to me. It was small, yet relatively spacious, fairly fuel efficient and it nicely suited my needs. Unfortunately, cars don't stay in the same condition in which you buy them. The body continued to rust and people commented on it frequently. I mean, it stood out. Silver with burnt orange highlights. But I didn't see it while I was driving it, and I can say it rarely bothered me that much. In the two years I had it, I did have to do two repairs aside from tire changes and regular services. After the last repair, I tried searching after a couple mechanics recommended finding something new. I really only repaired it to buy time, since I didn't want to have to buy a car under pressure. I had an ideal car in mind that I really wanted. After about a week, it became evident that financing wasn't an option for several reasons and I would simply have to wait, work, save, and pray. At the same time, God was convicting me in an area of my life which I felt to be very ill timed. But I obeyed His Word, in hopes that His promise would be fulfilled in my life. I have heard some great stories of God provision when people needed cars, and thought maybe God would do the same. It didn't happen. I simply had to be patient and use wisely what He was entrusting to me. By this summer, my Mazda was in rough shape. I got a cracked windshield, scratched the one side up, the body continued to rot, and now at 300k, it had an oil leak that was really leaving it's mark. Knowing it wasn't worth it, I decided not to fix this car, so I started hunting again. My hunt only lasted about a week. I browsed Kijiji, explored my options, knowing I wasn't going to get my ideal car, but searching for good alternatives. I have prejudices against certain vehicles, some perhaps without solid reason, so this made it a little more difficult, especially within my budget. I found something that interested me, but I didn't think I could afford it. Well, perhaps. I tried hard to figure out how it could work, and decided that if I compromised my financial principles, you know, just a little, it could work. After a few warnings, I decided against it, and I'm confident I made the right choice there. I found something else right away. 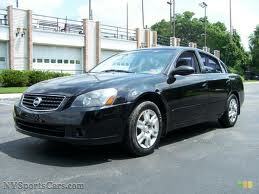 It was a black 2005 Nissan Altima 2.5S. It drove nice and looked good for the most part. It had some interior defects that I was disappointed about though, and some body scratches. After a couple hours of browsing dealers and viewing what was available within my budget, my mind kept coming back to that car. I waited two days, in which time I considered a lot of the pros and cons, and the cons started scaring me. But I felt that I would get a quality car, so in the end, it would be okay. The next week, I went to the dealer, and looking at it again, there was no doubt in my mind, I signed the papers and made the deposit. Now, I'm leaving out a lot of details here for the sake of time, length and privacy. But things didn't transpire exactly as I had hoped. The car wasn't ready when expected and not everything was done in it that I was told was going to be done. When I picked it up, there was a glaring defect on the vehicle that I didn't see there before, and am pretty convinced was not there when I drove it the week earlier, although I can't be entirely sure. The person who had looked at the vehicle with me couldn't remember if it had been there before, but it was pretty hard not to notice. I was a little disappointed. Driving home, it drove nice. Quiet. Much quieter than my old one, almost too quiet. And I had to be really careful not to drive faster than I normally did. When I got home, I found some questionable content hidden in the glove compartment, and decided to simply dispose of the evidence. It did make me wonder though. But a lot of the interior dirt and grime wiped out, so despite my disappointments on Day 1, there were things to be thankful for. Day 2 was my first day being seen by friends in this car. It felt kind of nice. But I also couldn't show it off as proudly as I would have liked. I thought it would feel better but it had some glaring defects I couldn't get past. There had been some marks inside the car that had puzzled me and I did have ideas, but since there was no noticeable odour, I ignored the thoughts. Then my friend mentioned cigarette burns. He hit the nail right on the head. I never asked the dealer if it had been smoked in and I couldn't smell anything, but now putting that and prior evidence I found together made me wonder even more. What kind of car did I buy? That evening, the engine light came on. How convenient. Day 3, I found out the car had a second paint job. An experienced painter could immediately tell. The paint had looked different to me, but it hadn't crossed my mind before. It made me wonder why. By the end of the day, I was totally depressed. I couldn't even look at my new car and be happy. It just left a sinking feeling in the pit of my stomach. I was completely deflated and felt like I would regret this decision forever. I felt like I had thrown away everything I had worked for into a car that I now felt cheated by. And then it hit me. Materialism. This was at the root of my depression. I had bought into the world's way of thinking long before I had bought this car. I wanted a car for more than for the sake of getting around, although that was very necessary. I viewed a car as a status symbol, just like the rest of the world. So when I bought a new car, I wanted it to be good. Now, I'm not talking very high end here. My ideal was rather very low in comparison to the luxury available. I didn't even want a brand new car. But I wanted something that was at least unique in my social circle. I wanted something none of my friends had. I wanted at least a few people to impress, even if just a little. So I couldn't get my ideal, but I still wanted the best I could get for the money I had. When I found the Altima, I felt kind of like I had done that. But this car has not given me the joy I thought it would. It made me a lot more depressed in three days than my rusty Mazda ever did. That's because material things ultimately can't satisfy us. They were never intended to. You can't buy a perfect used car. I learned that the hard way. Cars are not built to last and they will not stay in mint condition forever. So why do I put so much value into it? Why am I so depressed when I found out after I bought it that it didn't meet my expectations, when it had more defects than I initially saw? I mean, I got it and found out it didn't even have keyless entry! How annoying isn't that? Face it. A car can't give you joy. A car does not make you a better person, a better Christian, or a better witness. It doesn't actually make you cooler, or hotter, or rank you above others in your social circle. They are not a measuring stick of your worth. They don't stay perfect and you will never find a used car that is perfect. Even if you buy a brand new car, or a brand new house, it won't stay in that condition for long. It's not meant to, and it's not meant to satisfy you. In the end, it's just a car. It's purpose it to get you safely, efficiently, and preferably in moderate comfort from Point A to Point B and back again without problems. No, it's likely not your best interest to buy a car with 400k, body rotting out, that will have a host of mechanical problems, and if you're like me, been the home of ten different pets. It's definitely wise to invest in a quality vehicle that will effectively serve your needs and hopefully cater to at least some of your preferences. I also sincerely hope you are successful in finding such vehicles than I have been. But it isn't the most important thing in life. A car won't make me happy. Ultimately, joy and fulfillment is found in Christ. I may end up regretting the decision I made, but I have my doubts that it will seriously affect my relationship with Christ. Not unless I allow it to take an unhealthy hold on my life. My friends likely won't love me more or less. Neither will God. It may cost me more in some areas. I was prepared for that when I bought it. But in the end, it is just a car. I think I can live with it. Great job, Margaret. I think it's like this with quite a lot of things - we see them as a status symbol.